Also on day 261, i soaked in applecider, tea tree oil and pressed 3 small cloves of garlic into it. 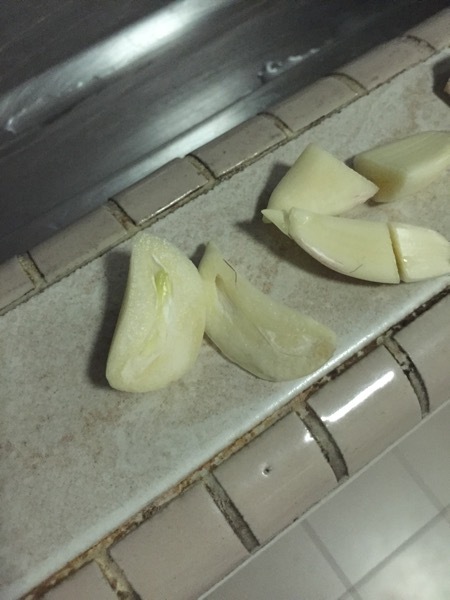 This time i left the garlic for 15mins before dumping it into the pail. I was happy to find a green sprout in the french garlic! Goes to show green sprout garlics with REAL allicilin does exist in Singapore! Was the itch from the garlic soak bacteria die off or the curry? Hmmm. I notice my right arm is getting more red lesions. And my neck has some too. Gah. My nose has been pretty blocked. The haze seems to be clearing up, i caught peeks of the blue sky that has eluded us for awhile. And it felt so cold today. Breakfast: kfc original twister(tomato, scrambled egg, mayo?, toasted wrap) totally yums. Others: 2 toastbox egg tarts?